D'varim/Deuteronomy 29:12 as He spoke to you and as He swore to your fathers, to Avraham, Yitz'khak and to Ya'akov. HaShem really speak? Did HaShem really take an oath? No, this is not a re-run of Eve's conversation with the serpent in Gan Edan; these questions have been asked since antiquity and continue to be asked today. They provide the basis for our faith today: we depend on the truth, veracity and credibility of G-d's words as reported to us; they form the substance and the authority for our lives. The two verbs in the text are both affix verbs, denoting completed action: , he spoke, is a Pi'el affix 3ms form of the root , to speak; , he swore, is a Niph'al affix 3ms form of the root , to swear [oath mplied]. The root is interesting because it is also the number seven and Davidson comments that "oaths were usually confirmed by seven victims", while seven is traditionally considered to be the number of G-d. Also interesting is that is nearly always used in the Niph'al stem - in most verbs, translated in the passive voice - so here having the idea that HaShem was bound by the men who received His words, or that He bound Himself to them by making the oath. Targum Onkelos is horrified by such a blatant anthropomorphism, so swaps for . 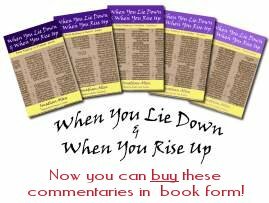 Yitzkhak Frank1 explains that "Onkelos uses the Aramaic verb in Qal to translate the Hebrew verbs: , rise, and , stand. The Aramaic in Pa'eyl is mostly used with the meanings swear (i.e. take an oath) or promise, but occasionally set up, establish and keep alive." Drazin and Wagner translate this as "he affirmed" and comment "to avoid the inappropriate idea that the Israelites are binding the deity with an oath: asking G-d to take an oath is tantamount to questioning the truth of His word, since an oath implies a promise of truthfulness". The suggestion that the patriarchs could actually bind HaShem in an oath is unthinkable; moreover, even asking for an oath betrays a shocking lack of trust or certainty in G-d's character. To what exactly does this speaking and swearing refer? Jeffrey Tigay suggests that the first clause "refers to the mutual relationship G-d promised to the Exodus generation in 'And I will take you to be My people, and I will be your G-d. And you shall know that I, the L-RD, am your G-d who freed you from the labors of the Egyptians' (Shemot 6:7, ESV) and 'I will be ever present in your midst: I will be your G-d, and you shall be My people' (Vayikra 26:12, JPS). Tigay reasons that "the older people among those Moshe is addressing here were alive then and received the promise, though they were then minors"; they heard the speaking at Sinai, even though they were only children or teenagers. He then adds, "The second clause refers to the L-rd's promise that He would be G-d to Abraham and his descendants: 'I will maintain My covenant between Me and you, and your offspring to come, as an everlasting covenant throughout the ages, to be God to you and to your offspring to come' (B'resheet 17:7, (JPS)." Some of Moshe's hearers might have remembered hearing G-d speak, but they certainly wouldn't have heard G-d making the promise to Avraham, so Moshe tell them that it was a solemn oath, given as part of a covenant-making ceremony: "I will establish My covenant between Me and you ... this is My covenant with you" (17:2,4, JPS). We live in a world that is increasingly obsessed with short-term decisions: never mind about the future, what I can do or get now. The future, after all, may never happen; all that matters is immediate gratification and survival. Even the body of Messiah is sometimes afflicted with this malaise which can be seen, for example, in the concentration on gaining converts and training in evangelism while ignoring long-term discipleship and study to develop mature believers being conformed to the image of Messiah. Fear of abandonment, fear of failure, fear of missing the moment, drive both the secular and spiritual worlds alike. G-d, on the other hand, is here for the long haul. He has been around since eternity past, will still be around until eternity future (we speak in human 'time' terms here) and is in no hurry to rush through His business with mankind. He will neither abandon us nor be abandoned; He will not fail and - since He sets the timetable, will never miss the moment. But how are we to know this and what is the connection to this week's text? Simply that G-d is the G-d of continuity and consistency; He says so - in His word - and has proved Himself to be so throughout history. Yeshua spoke of this when asked about the resurrection: "And as for whether the dead are resurrected, haven't you read what G-d said to you, 'I am the G-d of Avraham, the G-d of Yitz'chak and the G-d of Ya'akov'? He is G-d not of the dead but of the living!" (Matthew 22:31-32, CJB), predicating the resurrection upon the continuity of G-d. Following the same order as the text, we can see from the Bible that G-d has always had a plan and has always followed through on His plan. He has never had or needed a fall-back "Plan B" for when or if His "Plan A" didn't work. The Psalmist reminds G-d that, "Of old You laid the foundation of the earth, and the heavens are the work of Your hands. They will perish, but You will remain; they will all wear out like a garment. You will change them like a robe, and they will pass away, but You are the same, and Your years have no end. The children of Your servants shall dwell secure; their offspring shall be established before you" (Psalm 102:25-28, ESV). But even before the creation of the world, G-d had planned His Messiah: "He was foreknown before the foundation of the world but was made manifest in the last times for the sake of you who through him are believers in God, who raised him from the dead and gave him glory, so that your faith and hope are in God" (1 Peter 1:20-21, ESV), so much so that the Bible speaks of "the Lamb slain from the foundation of the world" (Revelation 13:8, . The Bible tells us too that G-d willingly bound Himself by an oath: "By Myself I have sworn, declares the L-RD, because you have done this and have not withheld your son, your only son I will surely bless you, and I will surely multiply your offspring as the stars of heaven and as the sand that is on the seashore. And your offspring shall possess the gate of his enemies, and in your offspring shall all the nations of the earth be blessed, because you have obeyed My voice" (B'resheet 22:16, ESV). When John the Baptist was born, his father reminded the people that, "This has happened so that He might show the mercy promised to our fathers - that He would remember His holy covenant, the oath He swore before Avraham avinu to grant us that we, freed from our enemies, would serve Him without fear, in holiness and righteousness before Him all our days" (Luke 1:72-75, CJB), linking both the promise and the oath; and the writer to the Hebrews confirms this: "So when G-d desired to show more convincingly to the heirs of the promise the unchangeable character of His purpose, He guaranteed it with an oath, so that by two unchangeable things, in which it is impossible for G-d to lie, we who have fled for refuge might have strong encouragement to hold fast to the hope set before us" (Hebrews 6:17-18, ESV). Finally, Rav Sha'ul makes it clear that we - as believers in Messiah - have also been chosen from the very beginning: "Blessed be the G-d and Father of our Lord Yeshua the Messiah, who has blessed us in Him with every spiritual blessing in the heavenly places, even as He chose us in Him before the foundation of the world, that we should be holy and blameless before him" (Ephesians 1:3-4). We stand, then, on very firm ground, on unbreakable promises and G-d's own oath, chosen and called, guaranteed our redemption in Messiah and founded upon G-d's own word. G-d has promised, G-d has sworn; G-d will do it. Depend on it. Application: As we look about us, it is easy to become fearful and afraid when we see how everyone else behaves. We are called to "stand firm" (Ephesians 6:13) and "see the salvation that G-d has prepared" (Shemot 14:13) for us. Do it today!